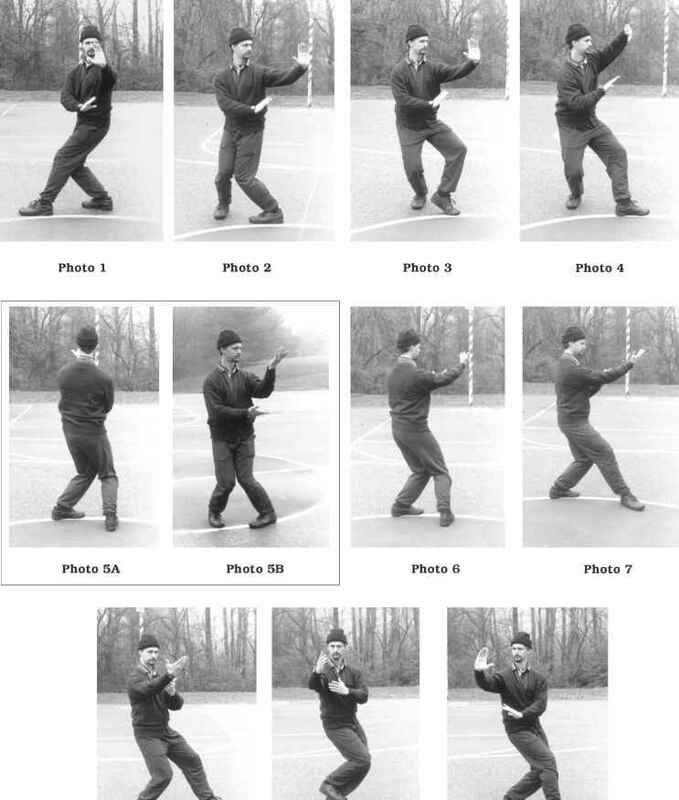 The single palm change is the quintessential action common to all Pa Kua Chang systems. 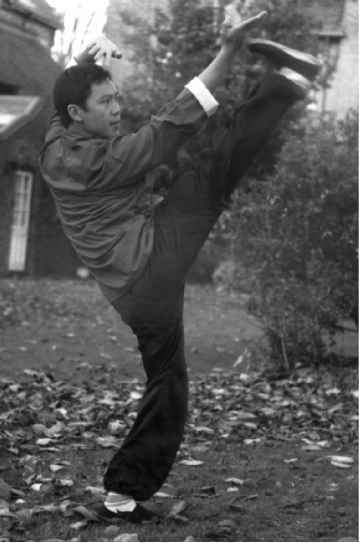 Although varying in articulation, orientation and syncopation the alignments of the limbs and crawl reflex action remain the same in all Pa Kua Chang systems. The particular single change demonstrated is that of Sun Lu-T'ang and is found in his book Pa Kua Ch'uan Hsueh or "Pa Kua Boxing Studies," Beijing, 1916. I began learning this change in 1975 under R.W. Smith. Mr. Smith learned the change under his teacher Kuo Feng-Ch'ih, a student of Chang Hung-Ch'ing and Kuo Han-Chih. In practice, work for continuity and evenness of movement. Do not lean. Let the eyes follow the index finger tip - changing your gaze as the fingers/palms exchange. Remember to maintain concentration on the tan t'ien and the head top. 2) Toe-in the right foot and address the perimeter of the circle with the left palm. The right palm continues to protect your left ribs (photo 2). 3) Pivot the left foot on the ball (photo 3). 4) Take a left step ahead along the circle and slightly toe out. At the same time, lift the left elbow, pointing the left thumb down and press forward with the right palm (photo 4 - the right wrist can be bent more than shown in the photo). 5) As you continue pushing with the right palm, toe-in the right foot as shown (photo 5A). At the same time point the left elbow down and turn both palms up. The right palm faces the left elbow (do not cross the arms). Photo 5B shows this position from outside the circle. 6) Begin turning back from the hips (the inguinals should be creased) and swing the arms palm up to the right (photo 6). 7) The right foot steps onto the perimeter of the circle and the right arm and palm follow it (photo 7). 8) The left palm, which is upward, follows inside the right elbow. As you circle, turn the palms toward the center (photos 8-10). Traditionally beginners should work on a gradual swing back requiring a full revolution to turn the palms to the center. Later the more rapid swing back can be synchronized with the step onto the circle. From the aspect of health the single palm change corresponds primarily to the heart and secondarily to the mind. It's action must be crisp and decisive. Esoterically it corresponds to revolution or transformation. The readers may consider the Greek concept of Metanoia or "spiritual return." Function is traditionally reserved for students of long standing. Suffice to say the lead arm can be used to deflect or attack, the toe-in can be used to scoop or lock the leg and the palms also show striking and chin na function. The readers should be wary of functions that stray too far from the form. About the Author: Allen Pittman is a senior student of R.. W. Smith and a disciple of Hung I-Mien (Taiwan). 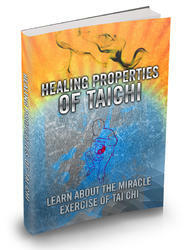 He has published two books on Nei Chia - Hsing-I and Pa Kua available through Tuttle Publishers. Presently he is working on a comprehensive treatise on the Pa Kua system of Kao I-Sheng (both linear and circular) which he inherited from Hung I-Mien. Allen Pittman was featured in Pa Kua Chang Newsletter, Vol. 1, No. 2.